Since the Mahim Causeway was the only link connecting the western suburbs to island city of Mumbai, this north-southwestern corridor would be highly congested resulting in a bottleneck at rush hours. The sea link was thus proposed about 50 years ago to act as an alternate route between the western suburbs of Mumbai and central Mumbai, in addition to the existing Mahim Causeway, thus easing congestion. This link would also form a part of the larger West Island Freeway spanning the entire coastline. The project was initiated more than 10 years ago in 1999 and was supposed to be completed within 5 years but it was delayed due to public interest litigations. It is India's first eight-lane freeway over the open sea and is hailed as a modern Indian engineering marvel. Few statistics about the bridge are: The bridge weighs 670,000 tons, which is equivalent to 50000 African elephants, the length of the bridge is 4.77 km, the height of the cable-stayed tower is 126m (equal to a 43-storey tower), and the length of steel wires used in the project is equivalent to the circumference of the Earth(each cable can take a weight of 900 tons). It was built by a team comprising of engineers from India as well as other countries including Britain, Canada, China, Egypt, Hong Kong, Indonesia, Philippines, Serbia, Singapore and Switzerland. 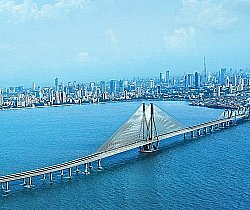 The bridge is a first ever open Sea Bridge in Mumbai and second in India after the Pamban Bridge. The traffic on the bridge is monitored by an Intelligent Bridge System and has a 16-lane, state-of-the-art toll plaza. The present toll ranges between Rs. 50 and 100 depending on the type of vehicle. Monthly passes are also available. Access will be controlled on the Worli end by toll plazas on the Khan Abdul Ghaffar Khan Road, and on the Bandra end by toll plazas at Love Grove Junction.